Paro Taktsang Monastery accounts to be one of the best tourist attractions in Bhutan. Although it requires ascending a thousand steps or more, the plentiful opportunities it offers along its way is simply enough to catch one’s breath. Make sure you plan to visit this antiquated monument of Bhutan, it has a strong contribution to the nation’s heritage. 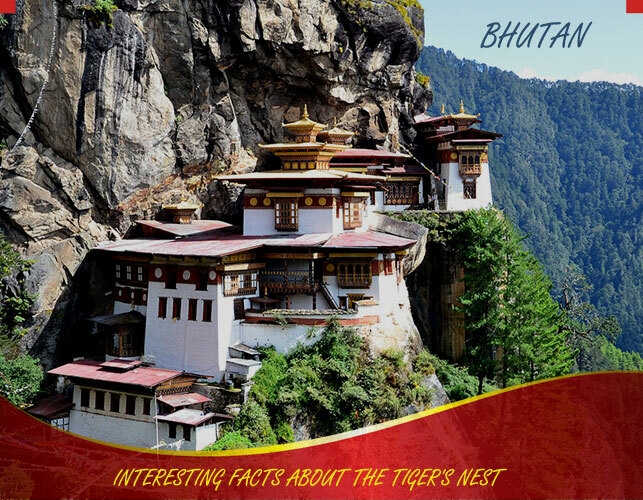 But before that, read the following few facts about Paro Taktsang Goemba, it is always better to have some knowledge about any place you’re planning to be. 1. Paro Taktsang is the popular name of Taktsang Palphug Monastery also known as the Tiger’s Nest, a prominent Himalayan Buddhist sacred site and temple complex, the noble icon of Bhutan. 2. The monastery is located in a dramatic setting, precariously perched on a high cliff at about 3,000 ft above Paro valley, and 10,240 ft above the sea level thus, making the path up to the monastery very steep and strenuous. 3. According to the legend, it is believed that Guru Padmasambhava, also referred to as the second Buddha in Bhutan first landed at this point in the 8th century. The mighty Guru, who is credited with introducing Buddhism in Bhutan. 4. Guru Padmasambhava, also known as Guru Rimpoche flew to this place from Tibet on the back of the flying tigress, meditated in the cave for three years, three months, three weeks, three days and “anointed” the place for building a monastery. 5. Today, Paro Taktsang is the best known of the thirteen Taktsang or “tiger lair” caves in which Guru Padmasambhava meditated. 6. In the year 1692, there was a foundation laid in front of the cave and soon after was built a beautiful structure (monastery) in seemingly impossible location. 7. The first temple was built by Gyalse Tenzin Rabgye, who was believed to be the reincarnation of Guru Padmasambhava and the erstwhile leader of Bhutan kingdom. 8. The monastery comprises of four temples and a couple of residential shelters that are uniquely designed to rest on the pretty mountain-side. Besides, the wooden bridges and stairs carved into the mountain and connecting the buildings, each structure owns a balcony which exudes a delightful view of the Paro Valley below. 9. Amongst the various paths that lead to the monastery, one most popular is the path through the pine forests and past the colorful prayer flags that are lined throughout so as to guard the temple from evil spirits. 10. Another path is towards the north passing through a plateau called “A Hundred Thousand Fairies”. However, there are also other paths for mule and pony treks but these do not go all the way to the temple top. 11. On your way up to the monastery, you’ll come across a number of prayer flags, wheels, and chortens accompanying your trek. You may pause for a while and get your soul relished with the spiritual essence and magical ambiance of the sacred mountains. 12. A huge prayer wheel is located in the courtyard of the main shrine. It is rotated every morning by monks marking the beginning of a new day. 13. Actually, the original structure of the temple was burned down in the year 1998. The temple was hard to access and the emergency assistance was near to impossible. Later, the monastery was reconstructed in order to guard the nation’s century-old Buddhist symbol. 14. The Tiger’s Nest that all of us can see today is a result of 135 million Ngultrum (about $2 million US) restoration and rebuilding project which ended in 2004. But despite the reconstruction, the monastery’s architecture and design still resemble that of the 8th-century temples. 15. In the year 2015, the Duke and Duchess of Cambridge, Prince William and his wife Kate Middleton made a trek to the Tiger’s Nest while visiting the Land of Thunder Dragons- Bhutan. 16. There are eight caves which surround and reside in the monastery but the two worth visiting are “Tholu Phuk” and “Pel Phuk”. Apparently, these are the caves in which Guru Rimpoche visited and meditated in. 17. During the months of March or April, the Tshechu festival is greatly celebrated in the Paro Valley in the honor of Guru Rimpoche. If you want to actually experience the ancient Buddhist traditions, then you must visit the monastery during this four-day festival. Also, the valley is more likely to be busy and crowded at this time. Bhutan attractions with its divine features are absolutely a treat to appreciate. So, hurry up and make your way to exploring the country’s most imposing Tiger’s Nest at Paro.